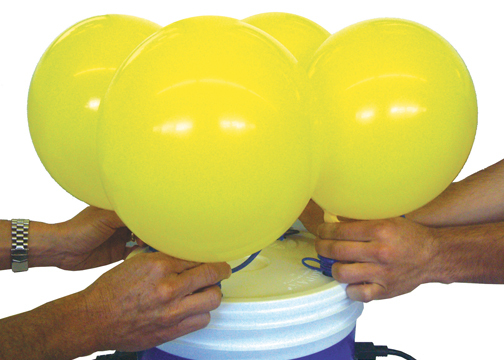 The Fastest Way to Inflate Multiple Balloons! The Air Force 4 is a must have for on-the-job decorating. Unmatched for its speed and efficiency, the powerful motor and turbo air intakes enable fast, simultaneous inflation on four outlets. The continual-air blower is designed to maintain a fixed temperature and not overheat on large jobs. 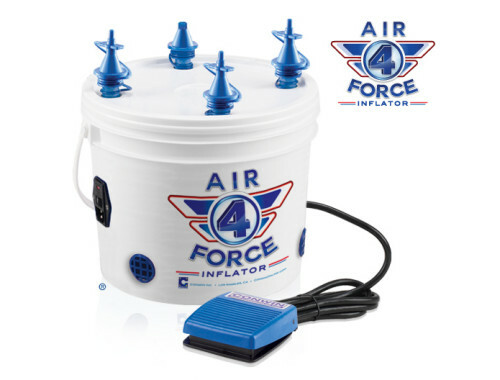 The electric inflator can be foot-pedal controlled or set to the continual “ON” mode for mass inflation of latex balloons. Attach the Large Balloon Inflation Hose to quickly inflate 16″ and larger latex balloons in 1/3 of the time. When working on a tight deadline, the Air Force 4 is the professional’s choice to get the job done. Extension Tips Make Inflating 5″ & Specialty Balloons Fast and Easy! Place the neck of the balloon on the extension tip and push the foot pedal or flip the continual “ON switch to begin inflating. Inflate 9-Inch and Larger Balloons! Remove the extension tips from the Friction Fit Outlets. Place the neck of the balloon on the filling outlet and push the foot pedal or flip the continual “ON switch to begin inflating. Inflate 16″ balloons and larger FAST! Pull up to remove one Friction Fit Outlet from the inflator and press the Large Balloon Inflation Hose onto the port. Place the latex balloon onto the hose and beginning inflating. A great way to inflate 3ft balloons for column toppers! Extension Tips make inflating 5-Inch & specialty latex balloons 2-inch in diameter and larger, fast and easy! Note: The Air Force Inflator is not recommended for 160 entertainer balloons. The large base of the Friction Fit Outlets are ideal for inflating 9-inch and larger balloons. 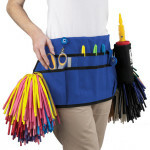 Outlets can be easily removed to attach the Large Balloon Inflation Hose or for adding on specialty accessories. 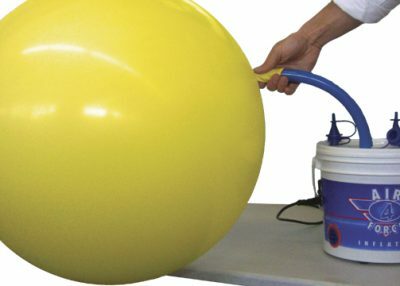 The hands-free foot pedal control enables workers to quickly inflate up to two balloons per person at a time. The foot pedal and power cord are detachable for quick setup. Makes transporting the Air Force 4 easy and comfortable. In the unforeseen event of an electrical mishap, the safety fuse will shut down the power system to protect the operator and the working components of the Air Force 4. IMPORTANT: Do not operate for more than 30 minutes on continuous run mode without resting machine for 10 minutes or overheating and damage can occur. Prevents the inflator from overheating.